Goals are to raise funds and public awareness for more post-adoption and foster care resources. We hope we can continue to educate the general public and encourage people to rethink that adoption is not about the process, but it’s about the person. The Mixed Roots Foundation is proud to announce its second year of teaming up with the Major League Baseball. This season will feature a double play of its signature 'Adoptee Day / Night ' Sporting Events including the Minnesota Twins and Los Angeles Dodgers, and Mixed Roots will kick off with its first non-MLB team this year, the San Jose Earthquakes, a member of the Major League Soccer (MLS). All three sports teams will debut and host their own inaugural signature events that will recognize and honor all who have been touched by adoption and foster care later this summer and fall 2013. 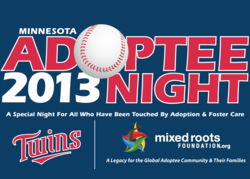 The signature sporting events schedule will begin with Adoptee Night with the Minnesota Twins which will be hosted on Friday, August 2, 2013 – 7:10 p.m. at Target Field in Minneapolis, MN where they take on the Houston Astros. Pregame activities include the First Pitch, National Anthem, Fireworks and a pregame gathering. Adoptee Day with the Los Angeles Dodgers vs. the San Diego Padres will take place on Sunday, September 1, 2013 – 1:10 p.m. at the Dodgers Stadium in Los Angeles, CA and will include a pregame gathering as well as the First Pitch and opportunity for kids to run the bases at the game. Finally, Adoptee Day with the San Jose Earthquakes will include a First Kick at its last game of the season against FC Dallas on Saturday, October 26, 2013 – 2:30 p.m. at Buck Shaw Stadium, Santa Clara University in Santa Clara, CA. Additional pregame activities will include the National Anthem as well as opportunities to network with local businesses and organizations that support the greater adoptee community. All signature sporting events will leave in the hands of 'Adoptee Day / Night ' pregame participants with a signature rally towel that individuals can use, take home and bring to future events. Additionally, a portion of all signature sporting event tickets sold will benefit the local community including for the first time, Mixed Roots will collaborate with select local community organizations that will serve as community partners whose vision and mission align with providing important post-adoption resources that include programs and services that inspire the next generation of adoptees to achieve their dreams and goals. Mixed Roots new community partners and details of specific pregame activities will be announced as it gets closer to each game date. In the meantime, tickets are currently on sale for all games; To buy tickets, become a sponsor, volunteer, or learn more about Mixed Roots Foundation and its partners, programs and events, please LIKE Mixed Roots Foundation on Facebook, call 800.659.6958, email events(at)mixedrootsfoundation(dot)org, or visit http://www.mixedrootsfoundation.org. Mixed Roots Foundation is a 501(c)(3) nonprofit organization and recently celebrated its second year anniversary in May with its global headquarters based in San Francisco, CA. Mixed Roots serves as the first and only national / global multicultural adoptee led foundation for all adoptees and their families that is representative of the international, domestic, and foster care adoption experience and aims to leverage philanthropy to provide more post-adoption resources by promoting and supporting organizations that serve as a resource to the diverse adoptee community, create more awareness about the adoption experience and inspire the next generation of adoptees to achieve their dreams and goals through collaboration with likeminded individuals, businesses, and organizations in the greater community.